Exposure of a post Variscan, north-south fault with a remarkable 25m wide zone of crystalline calcite indicating the presence of a major fluid path way. Geological / geomorphological features: [Provisional] Structural geology: Crystal Cove includes a well known exposure of a relatively late (i.e. post-Variscan) north-south fault zone, associated with a remarkable 25 m wide zone crystalline calcite - indicating the presence of a major fluid pathway. 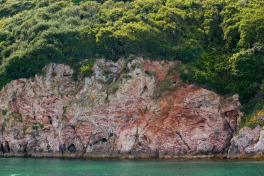 The fault zone separates the Goodrington Limestone Member of the Brixham Limestone Formation from sandstones of the Torbay Breccia Formation. Reasons for proposal as a CGS / RIGS sites: The remarkable 25 m zone of crystalline calcite may be unique in the region and is a well-known geological feature in the district. Although damaged by mineral collectors, the feature is of educational value, especially due its proximity to Broadsands and Saltern Cove.